Railway Notice Regarding Upper Age Limit can be seen down the post. After the hue and cry over upper age limit in the recent railway recruitment (CEN 01/ 2018), RRBs have clarified on the matter. Through an official notification, Indian Railways has made it clear that the upper age limit set for Assistant Loco Pilot and Technician post is 27 years, as per para 137(2)(ii) of the Indian Railway Establishment Manual Vol.I revised in 1989(Reprint in 2009). The Board further mentions that as a temporary measure Ministry of Railways had allowed a relaxation of 3 years, till 3 February 2015. As per the manual, the upper age limit for OBC candidates is 30 years and SC/ ST is 32 years. 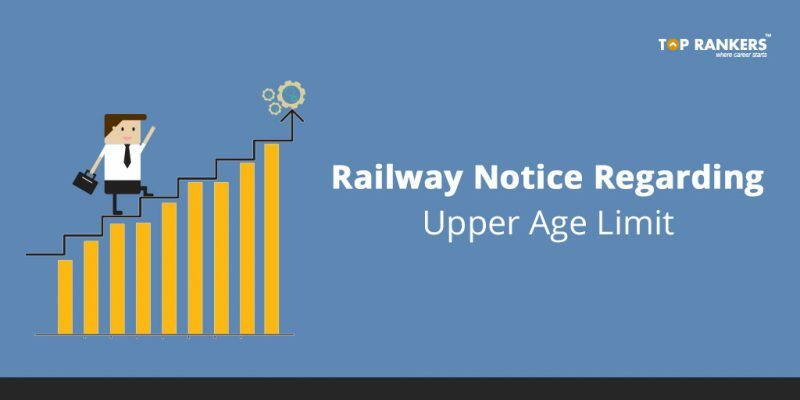 However, relaxation of 3 years over and above the aforesaid upper age limit was introduced by Ministry of Railways, as a temporary measure till 03.02.2015. Therefore, after 03.02.2015, the aforesaid relaxation is not available. However, keeping in view the interest of the candidates, this is being reduced in a phased manner over a period of 4 years. The board has also decided to enhance the maximum age limit for re-engagement of retired hands to 65 years from the existing age limit of 62 years. Further, it has also been decided to extend the validity of the scheme of re-engagement of retired employees to January 12, 2019 as against the existing validity up to September 14, 2018.